The future of Crete was settled once and for all at the end of the Balkan Wars, in accordance with the islanders' fervent desires: the union of Crete with Greece was officially declared in 1913. From then on the island was an integral part of the Greek state, with its own share in the political and military misadventures of the ensuing years. 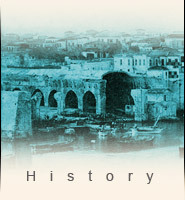 The Asia Minor disaster in 1922 dealt the final blow to the "Megali Idea", while also marking the beginning of the Greek interwar period (1922-1940). The Greek state then set its sights on internal reorganization and the rehabilitation of over a million refugees. Thousands of refugees settled on Crete, particularly in Heraklion. At the same time, the last 23 821 Muslim residents were forced to abandon the island. The population grew apace, as new suburbs such as Nea Alikarnassos, Tria Pefka, Katsambas and Patelles were added to the townscape. Marked changes in the inhabitants' everyday life also occurred. The port was extended, the number of cars on the streets multiplied and the town acquired an aerodrome. Concrete, electricity, the telephone and the radio appeared on the scene in Heraklion, altering time-worn habits and practices. On the eve of World War II, Heraklion was by sight a booming modern urban centre, with bustling mercantile and shipping activity and a lively social scene.